Some of these factors depend upon events that are beyond the control of any level of government within Canada. Setting aside global economic conditions, however, strategic tools are available to federal, provincial, and municipal governments that can significantly affect emerging urban structure. Some of these are summarized briefly in Table 6.1. Aside from immigration policies that affect where new immigration contributes to rates of growth, federal government policies and strategies can indirectly influence both land development patterns and travel behaviour through changes in taxation and direct financial contributions. 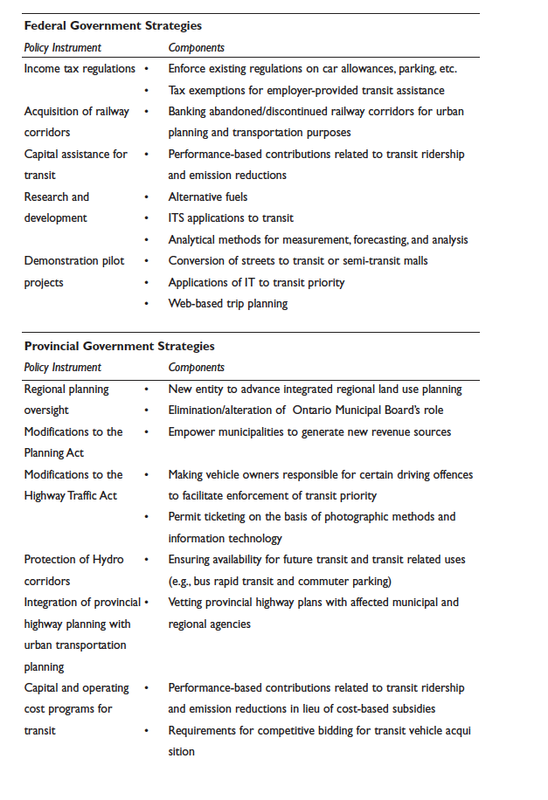 Provincial government policies and strategies, which can have a potentially more direct impact, include changes to the Planning Act and the Highway Traffic Act, in ways that provide more oversight at the regional level to integrate local municipal official plans, permit municipal organizations to broaden the range of revenue sources, and alter traffic control regulations in favour of improved transit competitiveness. 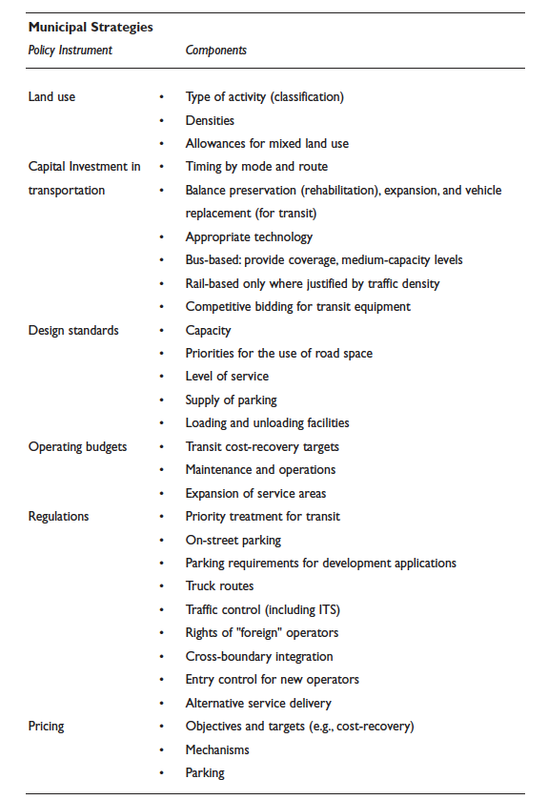 Provincial municipal and regional transportation programs (both funding and planning), of course, also represent important tools for implementation. Municipal policies and strategies involve land use planning in the form of official plans, density and subdivision controls, priorities for spending on roads and transit, fares and cost recovery targets for transit, parking regulations associated with new development, and priorities for the use of road space. Municipal land use and transportation policies directly affect the form of land use development, mixed land use, performance of the transportation system, and both how, where and when individuals travel. Among these various policies and strategies are a number of well-known characteristics that influence urban structure and the resulting travel demands and behaviour. For example, automobile-oriented residential development and relatively modest transit services contribute to automobile dependency and lower use of transit. In addition, federal tax regulations, which influence automobile ownership and use and motor vehicle standards (including exemptions for vans and sports utility vehicles from voluntary industry standards for fuel consumption), influence vehicular emissions and therefore air pollution. In addition, extensive experience in the Central Ontario Zone (and elsewhere) indicates that, by and large, travel choices appear to be influenced more by level of service than by fares. A large majority (more than 70%) of those who use GO Transit commuter rail services, for example, choose to do so even though they have an automobile available for the trip, largely because they view the service as competitive from the standpoint of travel time and reliability. Here, there are obvious strategic implications for other elements of the transit system, namely, to provide faster, more frequent, and more reliable surface transit service.